Welcome to MyBinding video. 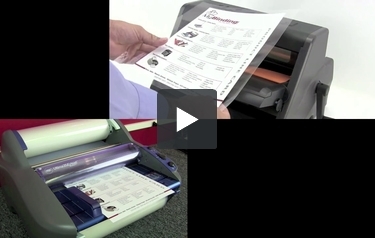 Once a roll laminator is all set up and ready to go, it is fast and efficient. Whether it’s hot or cold lamination, MyBinding.com has a great variety for you – anywhere from 12 and 14 inches, all the way up to 27 inches and beyond for institutions and schools. MyBinding is here at your service. We’re just a click, call or chat away and we’ll walk you through what you need and how you can get it fast. And our machines come with a range of user control panels for more flexibility. Many of these machines and the supplies that go with them do a lot more than just straight lamination – permanent and repositional stickers, magnets, clear on one side and opaque on the other, plenty of options. You’ll also find on our website plenty of how-to and demonstration videos so you know how to load and operate your machine properly and most efficiently. Because when image matters, MyBinding.